Bollywood Weddings that have Become the Talk of the Town! As true desis, anything and everything Bollywood related, interests us. Gossip, drama and especially hook-ups. 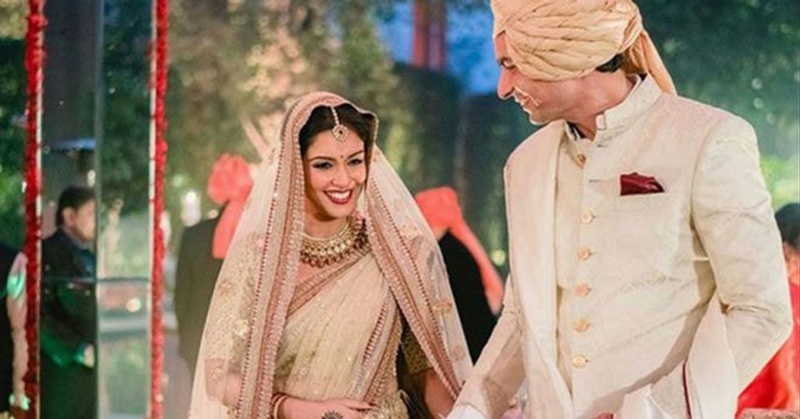 And even though B-town celebs aren’t known to have the best history where relationships are concerned, some who are jumping onto the marriage bandwagon are redefining this very stereotype. Whether it was Geeta Basra and Harbajan Singh, Shahid Kapoor and Mira Rajput or our favorite fashion beau Masaba Gupta and husband Madhu Mantena – long-term-forever-commitments are being boldly taken AND proclaimed to the whole world! 2016 saw this trend continuing with Asin and Rahul’s wedding as well as Sanaya Irani and Mohit Sehgal – two weddings that spoke of class and style; And we have all the details you want to know! Besides all the attention that the couple got, not even for second they took their eyes off each other. Wearing a Sabyasachi and Raghvendra Rathore, they managed to spread the magic only with their smiles. A backdrop of clustered red Roses, just added more glory to their magical story. White off-shoulder flared dress with caped neckline and detailed floor-length veil by Vera Wang. We love how she chose to keep her hairdo and jewellery minimal with blush makeup, and letting the blush ombre lehenga by Abu Jani Sandeep Khosla do the talking. A 5-tier white wedding is giving a tough time to our diet goals, decorated with fresh flowers and gold ribbons. Akshay Kumar was the Best Man, as he was the one who played the matchmaker. A gold lehenga by Sabyasachi, with a double dupatta style and minimal polki studded necklace set . We can’t seem to get over the finely done eye liner and maroon lips. We love how beautifully balanced this celebrity wedding was. The simplicity in their Christian wedding and the grandiosity of the Hindu marriage made every element special in itself. Asin wore the most prominent designers in the wedding industry for each occasion, with their classic styles spelled out in each outfit – Whether it was the Vera Wang wedding gown, the Sabyasachi bridal lehenga or her reception lehenga designed by the exceptional Abu Jani Sandeep Khosla. A simple hairdo adorned with Jasmine flowers. Sanaya chose a red and gold lehenga, with polki necklace set and delicate maangtikka. The bindi with complementing lips is a win-win bridal look. Sanaya Irani and Mohit Sehgal, AKA 'Monaya' (the adorable ship name created by their fans) got hitched on a gorgeous beach wedding held at Planet Hollywood Hotel, Goa. And even though the wedding faced a little disaster where the entire mandap collapsed, this stunning couple took it in their stride and let nature encompass them all around.